Handmade & handcrafted gifts are special, they are created from the artisan's vision and hands. There is an energy that flows from each piece carefully, lovingly crafted. No matter how many pieces created each one has its moment of being held up admired with pride and satisfaction before being offered up to a new home. I am taking part this year locally in a couple of holiday shows, it has been busy but very rewarding, it has spurred my creative juices and I have enjoyed connectiong with so many freinds and former customers. This weekend is the annual Christmas in the Villlage in the picturesque village of Gagetown, NB just a few miles away and on Sunday 1-4pm we are hosting a Holiday Open House at Three Elements, 300 Wilsey Road in Fredericton, NB. Don't forget to submit ideas for the Flip-Pal Tm Mobile Scanner and get entered for a chance to win one! Perfect for the holidays! Happy creating! DCC Flip-Pal Hop! Recipes to Remember! 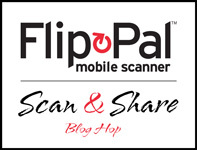 Flip-Pal� mobile scanner has partnered with the Designer Crafts Connection Blog Hop to offer the "Scan & Share" Blog Hop Challenge! This challenge is two fold?first for participating "Scan & Share" Blog Hop designers to create personalized gifts and projects in a wide array of different crafting categories while using the Flip-Pal� mobile scanner and second, having blog hop followers join in and share their creative ideas. Now on to my project, since I am primarily a sewing designer and love to sew I wanted to use the Flip-Pal� Mobile Scanner in an apron for my daughter the pastry chef. I have a cookbook of my Mom's like a lot of us do, the one where she handwrote in recipes, pasted in ones from friends. The pages are worn, many covered with spots of dried batter and the book now has to be handled carefully. With the Flip-Pal� Mobile Scanner I could gently open the book and hold it over the page scanning in whatever recipes I wanted. The Friendship Muffin recipe is one I remember her having a container of this mysterious batter which was portioned off to friends and supplied us what seemed like forever with muffins! Here are some of the recipes included in this retro cute apron along with an image from the Vintage Workshop Kitchen 11 collection. The details I added to this apron I made using the Flip-Pal� Mobile Scanner to personalize and make it special could be applied to a purchased apron. Printed out on Avery Printable Cotton it can simply be ironed on, no sewing required! Just think of all the special thoughtful gifts to be made! Hop along with the DCC button to the right to be inspired with more projects and ideas just in time for the holidays! I also wanted to create a fun detail with adding wooden spoon appliques. I took out my favorite wooden spoon, picked up the Flip-Pal� Mobile Scanner, took off the cover and placed it over the wooden spoon. It required two scans, it is a big spoon. :) The scanner has a Stitch feature which "stitches" scans together, just make sure to have adequate overlap. Below is my scanning of the spoon, "stitching" them together, sizing and printing out on Avery Printable Cotton. I printed out the recipes onto one piece of printable cotton after scanning them. I cut them apart, ironed onto the fabric border and stitched in place and yes there is the Friendship Muffin recipe! Here is to creating with inspiration, integrity & great products! unless I feel I can give a fair assessment. try out. I will and do accept and keep free products and other forms of compensation from companies. with a product and any claims or further information should be obtained from the manufacturer.